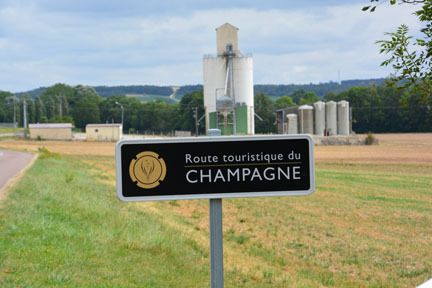 Given that the basic concept of Champagne is to maintain consistency of the product by evening out vintage variation by blending, one tends to think of Champagne as a bit static in its approach. A visit to Michel Drappier gave me a different perspective, when I visited last week as part of research to update my Guide to Wines and Top Vineyards of Champagne. Located on the Côte de Bar, well south of the main area of Champagne, and in fact closer to Chablis than to Reims, Drappier seems to occupy the center of Urville with a large group of buildings off the main road. Driving from Troyes to Urville along the Route Touristique de Champagne gives a rather different experience from, say, driving along the Côte de Blancs south of Epernay. The Côte de Blancs gives the impression of a monoculture of vines on gentle slopes: the Route Touristique along the Côte de Bar passes through more fields of sunflowers than vineyards, giving somewhat the impression of an alluvial valley. The vineyards in fact are along slopes a mile or so off the main road. 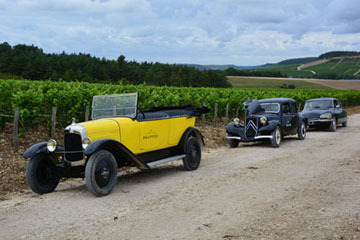 The visited to Drappier started with a trip out to his top vineyard, Grande Sendrée, in a fleet of old Citroens, led by the bright yellow Torpedo from the 1920s, followed by a 1930s model, and ending with the famous DS (which for me always brings Maigret to mind). The name of Grande Sendrée reflects its origins. A big fire in 1836 burned the whole village and the forest around. The ash was a good fertilizer so the area was planted with vines. Before phylloxera the village reached 370 ha, but now has only 170 ha. “This is an improbable place to make wine but it’s become iconic,” says Michel. “Grande Sendrée is a terroir not a clos. The name comes from cinders, it should be Cendrée. But whoever made the mistake made our fortune, because it’s a monopole.” The particular feature of the soil is that the limestone was broken up so it has more clay and humus. “It’s Grand Cru Chablis soil with Pinot Noir from Burgundy to make Champagne,” Michel says. Grande Sendrée was one of the early single vineyard cuvées. “In 1974 we decided to make a separate vinification and wanted to have a separate cuvée, but it was an awful vintage so we did not declare it. The first release was 1975,” Michel explains. It’s usually produced every 2-3 years. From the 5 ha of Grande Sendrée you can see back to Urville and some of Drappier’s other vineyards beyond the village. Michel points to a plot of Pinot Noir that is used to make a red Coteaux de Champenoise. Adjacent to it are plots of some old varieties, no longer much grown in Champagne: Arbane, Petit Meslier and Pinot Blanc. These are the basis for the unusual cuvée, Quattuor. “My father is very experimental and is always trying things,” says Charlene Drappier, as she takes us round the cellars, which date back to 1155 and were built by St. Bernard (who left Burgundy to found the abbey of Clairvaux). St. Bernard is supposed to have brought Morillon (a possible ancestor of Pinot Noir) from Burgundy. “So we have 800 years of Pinot Noir in the house,” Charlene says. “The cellars are made of Kimmeridgian limestone, so the vines grow on Kimmeridgian limestone and the bottles mature in it.” One experiment manifested itself in a wooden “egg,” in which the wine is supposed to mature with a natural movement of fluid that in effect keeps it in contact with the lees without any battonage. Grande Sendrée 2008 is not so much overtly rich as simply full of flavor. The Grande Sendrée rosé is unusual for its perfectly integrated red fruits. For me, obvious red fruits give a rosé a disjointed impression, but this is a rare case in which they really integrate to make a characterful wine. And then there is the Charles de Gaulle cuvée, faintly toasty, showing the typical body of Pinot Noir, which certainly dominates, with an impression more towards stone fruits than citrus. “The Charles de Gaulle cuvée is named for the general because he was a customer in the sixties, but not a big one. We would have preferred to have had Winston Churchill. That is probably why Pol Roger is a major house and Drappier is a small one,” Michel says wryly. Dosage is modest on all the cuvées. “My father used to have 13 g dosage, when I began it was 12 g, then it came down to 11 g, and from the nineties to 2005 it was 9 g. Now it’s always under 7g,” Michael says. Michel is on a constant quest to understand and control every aspect of his wine. The liqueur d’expedition is produced in house and matured for 15-20 years in oak vats and glass demi-johns, there is no transvasage and sizes up to 30 liters are matured in the bottle, and a new shape of bottle is about to be introduced with a narrower neck to reduce oxidative exposure. It’s all go. Following a day visiting three “modernists,” where the hallmark was elegance and delicacy, I set out to visit three “traditionalists,” to see if I could define their common distinguishing feature. Vietti is located in the heart—well really one might say at the top of—the hilltop town of Castiglione Falletto. Set in two buildings around a charming courtyard, the only place to build the winery is below, so it extends for three storeys underground. The oldest part is right up against the medieval town walls. The modern era at Vietti started when Sabino Vietti returned from the States to take over in the early twentieth century. Known as the “crazy Americano,” he had strange ideas such as buying land in other communes. “We have always been known as a Barolo producer,’ says Elena Vietti, but Barbera is very important to us—we try to make extraordinary wines from the ordinary.” Some of Vietti’s vineyard sites in the Barolo DOC area that could be planted with Nebbiolo are planted with Barbera. La Crena comes from vines planted in the 1930s, and Scarrone Vigna Vecchia comes from vines more than 85 years old. Far from the rustic reputation of Barbera, these offer a creamy sophistication with deep flavors. 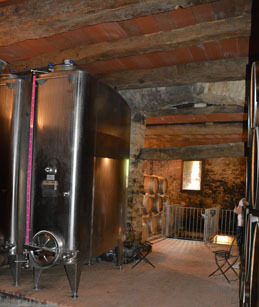 A stainless steel vat stands in front of a window in the old fourteenth century walls in the Vietti cellars. “We consider ourselves one of the most traditional wineries,” says Elena, “for example, in using very long maceration times, but many things that are modern are normal now. It’s not just about botti and barriques.” She describes Vietti’s philosophy. “So long as you do not impose your personality, so long as you respect the soil, it’s traditional.” Vietti has vineyards in 15 different areas, but produces one blended Barolo and four single vineyard wines. “It would be very complex to produce 15 different Crus.” All the wines are vinified by parcel, but after two years of maturation in botti, all except the single vineyard wines are selected either for the Barolo blend (called Castiglione) or are deselected into the Langhe Nebbiolo, which is effectively a second wine. Going up the line, the Lange is quite restrained, Castiglione shows more aromatic life and delicacy, and the single vineyard wines are yet more refined. There’s a lovely contrast with the Barbaresco, which has a more savory, earthy character. 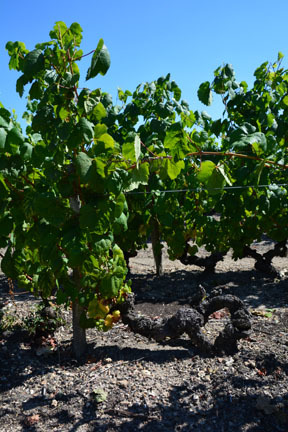 No argument here that traditional winemaking is representing the differences in terroir. From Vietti’s terrace on one side of the valley, you can see across to Serralunga d’Alba on the other side, where my next visit was to Massolino, which is in full flight of expansion, with a large extension to the cellar, just being completed, looking over the valley from the edge of the town. “All our Barolos are aged in traditional large botti, with very neutral oak,” says Franco Massolino. Neutrality of the oak, which comes from Slovenia and Austria, is a major concern here. Wines are vinified in cement vats. “We did experiments with stainless steel and cement, we always preferred the cement, although it’s a very fine detail,” Franco explains. Vinification for the single vineyard wines is always exactly the same in order to bring out the differences in terroir. 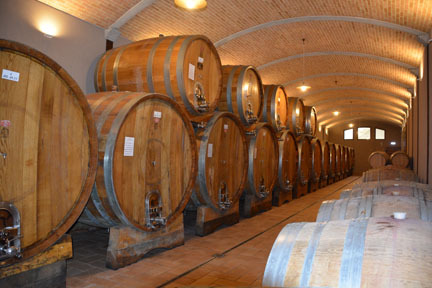 Massolino’s new cellar contains both traditional botti and modern barriques. The Barolo makes a classical impression with relatively light color and delicacy of expression. Then Margheria shows a little more intensity, a sort of silky sheen covering the palate. Coming from older vines, Parafaoa is deeper and velvety, a lovely balance between concentration and delicacy. Then Parussi shows more power and a more savory inclination. There is simply no mistaking the fact the terroir is the driving force, as the wines show the full range of Barolo, from subtle delicacy to smooth elegance, and each is quite distinctive. There could scarcely be a greater difference between the snazzy modern cellars at Massolino and the old cellars of Guiseppe Mascarello, located by the railway station in Monchiero. “We are 3 km out of the Barolo DOC,” explains Elena Mascarello, “but we are a historic cellar, so we are authorized to make the wine here.” The building, a slightly dilapidated looking warehouse, dates from the second half of the eighteenth century, and Mascarello has been making wine here since the 1920s. Concrete or fiberglass tanks are used for vinification; everything is matured in rather old botti—there isn’t a barrique in the place. 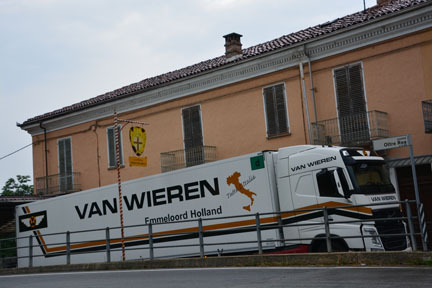 I had to move my car to make way for a huge truck arriving at Mascarello. The famous Monprivato, coming from a vineyard in Castiglione Falletto, is the biggest production here. Tasting the 2010, I was startled by how approachable it is already. I quizzed Elena as to why Monprivato today should be more approachable than it was when first produced in the 1970s, but it seems that whatever changes are responsible lie more in viticulture than vinification. Purity of fruits shines out, the tannic structure is very fine but somewhat hidden behind the fruits, and there’s a silky finish. Coming from what is surely one of the most traditional producers, this has none of the toughness of youth that you might think is the marker of tradition, and perhaps shows the greatest purity of fruit in my tastings so far. Roll on tradition. During my week in the Douro, I met several producers who come from families long involved in Port, but whose companies or quintas have been sold or absorbed into larger companies during the ups and downs of production. Often they have started out again with a vineyard that was retained in the family. 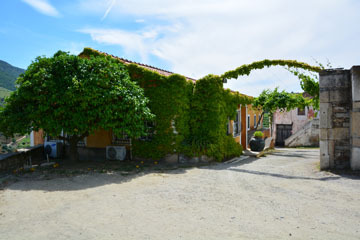 The Van Zellers owned Quinta da Noval until it was sold in 1993 as the result of problems in the family, and the eponymous production company, van Zellers, was sold with it. Cristiano van Zeller managed to buy back the name of van Zellers in 2006 when it had become more or less moribund, and this is now his negociant arm. Quinta Vale D. Maria has been in his wife Joana’s family for several hundred years, and had been leased to Symingtons until Cristiano obtained ownership in 1996. I admit to a loss of confidence that there would be a winery at the end of the road as I drove up the single track unpaved road that hugs the edge of the mountain, but there near the top was Cristiano waiting at the winery. Built into the hillside, it’s larger than it appears from the outside, and is stuffed with equipment, but Cristiano is hoping to build a new underground winery some time soon. There’s a mixture of granite lagares and stainless steel fermentation vats, but the plan is to replace the vats with more lagares as Cristiano feels this gives more subtle results in the wine. 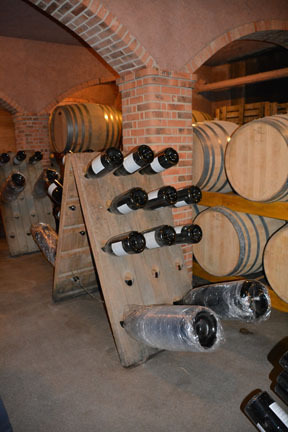 Production is focused on table wines, both white and red, but there is also a range of tawny and vintage Ports. Wines under the van Zellers label include at least some purchased grapes, but the tendency is to depend more on sources within the estate. The wines of Quinta Vale D. Maria range from the entry level Rufo to single vineyard wines that highlight parts of the quinta. The one word I would use to describe the wines is sophisticated. Displaying silky textures, the whites have a definite trend towards minerality, especially when you go above entry level. The reds are elegant and silky with a lovely sense of precision to the black fruits on the palate. Although alcohol is high, it’s never evident on the palate. The style is subtle. Several vintages of the eponymous wine, labeled just Quinta Vale D. Maria Douro, which comes from the center of the quinta, reinforced my impression that it’s a mistake to drink the red wines soon after release, because with an additional year or so, the aromatics really come to life. 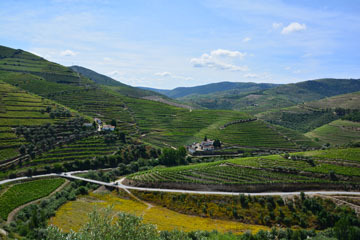 The single vineyard wines show the properties of different blends and locations, from Vinho de Francisca (named for Cristiano’s daughter who now works with him) to Vinho do Rio, which comes from the lowest altitude vineyards, close to the river, and offers the most dense impression of all. This comes from a single vineyard of just less than a hectare at an altitude of 400-500 m. The vines are 80-90 years old, with a huge mix of varieties. Slight smoky spicy nose from oak. Smooth and silky on palate with mineral impression. Very fine and elegant. Slightly lifted black fruit aromatics on nose.Very fine, elegant ripe fruits fill a smooth palate with layers of black fruit flavors just coming out, supported by silky tannins on the finish. The main difference with younger vintages is not so much softening on the palate as the development of broader flavor variety. This comes from the vineyard at the lowest altitude, by the river; it’s about 1 ha and has 29 grape varieties, although 47% is Tinta Barroca. The nose conveys a sense of density. Dense black fruits dominate the palate and are spicy on the finish, which shows velvety tannins. Quite reserved at this point, time is needed for the tannins to resolve to show the underlying smoothness of the palate. Not so much sweet on the nose as slightly perfumed. Dark and sweet on palate but cut by lovely piquancy on finish, which is sweet with that touch of perfume coming back retronasally. Very good intensity. I’ve always thought that the tipping point when Bordeaux changed from its traditional herbaceous style to the modern fruit-driven style was 1982. A series of vintages of Lynch Bages has caused me to revise that conclusion and move the tipping point forward at least to 1990. Considered by many at the time to have an unprecedented richness that would preclude aging, the 1982 was certainly the first vintage to be instantly delicious on release. It continued to be eminently drinkable in the same style for twenty years, but around 2000 showed the first signs of reversion to type, which is to say showing a delicious touch of herbaceousness to counterpoise the fruits. 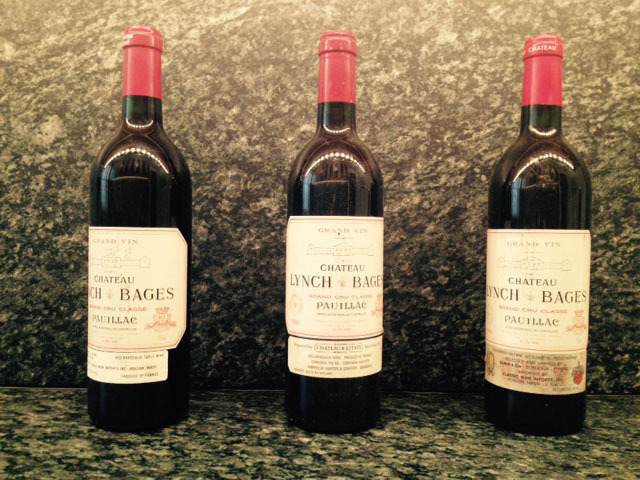 My recent experiences with Lynch Bages 1982 show significant bottle variation, with the best bottles showing a generous softness that recalls the original character of the vintage, but others showing an extreme cigar-box like dryness that more resembles the 1975 vintage and suggests the fruits are drying out. At least for the last ten years, it’s been reverting to type, which is say to the pre-1982 tradition, so the change in character was more a matter of style for the first decade than a permanent tipping point. The lush, rich character of the 1990 far out shadows the 1982, although it also now shows significant bottle variation. The range recently has varied from a bottle showing a touch of classic cigar box to cut the fruit to one that was completely undeveloped, rich and aromatic to the point at which first thoughts might turn to the New World. The latter seems to be the more common experience, and the sheer power of the aromatics makes me feel this may be a Cheshire Cat wine, with nothing left behind as the structure resolves. It seems so completely different in character from traditional Bordeaux as to represent a permanent break with tradition. In terms of pinning down a tipping point, the 1988 is definitely old school; pleasant enough, losing some fruit now, but in the tradition of restraint rather than extroversion. By comparison with the 1990, the 1989 seems to offer reminiscences of traditional Bordeaux; faintly animal notes might suggest a touch of Brett (a big problem in Bordeaux at the time), making it difficult to judge the force of the fruits, but although they are deep and black, in the end the sense of tannic structure brings a restraint that is lacking from the 1990. Along with these recent vintages, I have also had the 1961. To my palate, this is unmistakably the real thing: elegant fruits, lacy acidity, a touch of cigar box. A tribute to Bordeaux’s traditional longevity, it seems hardly to have changed in character since I first tasted it in 1982. For all the technical advances in viticulture and vinification, I don’t think any vintage since 1961 has produced its equal. I will accept that there have been great advances, especially in turning vintages that would have been write-offs into good wines, but why can’t we produce anything of the like of 1961 any more?